The Carver is a tilting three-wheeled vehicle using an automatic balancing technology to balance the passenger compartment under all conditions. The Carver vehicle combines aspects of a motorcycle and a car, both in appearance and design and was produced by Carver Europe in the Netherlands. 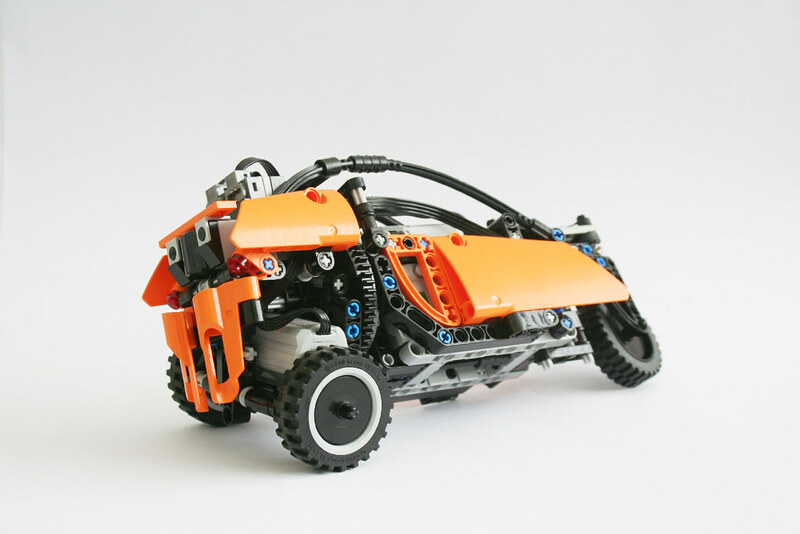 Vmln8 a builder from New Zeland made a nice LEGO version with Technic parts, months ago, quite successfully as you can see from his video below. Look at the solution used to implement the steering and dynamic cornering behavior for this kind of motorcycle. In fact a car/motorcycle hybrid. You can find further pictures at Vmln8's flickr account and even building instructions from Rebrickable. Unfortunately such vehicles are not in production since 2009, as they turned unprofitable due to the lack of demand at the high prices they were sold. But you can still see a couple of nice videos from a real Carver in action, on a test drive by Richard Hammond and another by Jeremy Clarkson for the BBC TopGear show.